There have been a few collectable dice games commercially released that rely on dice for gameplay. You can learn more about these games, here. Inspired by Collectable Card Games, a few Collectable Dice Games (CDGs) have been released commercially. Many are no longer produced but still have a small following anyway. They are played with specially marked dice unique to their individual game theme. Dragon Dice the CDG was originally published by TSR Inc. in the early 1990s but is today published by SFR Inc.. Lester Smith created the game which contains characters unique to its fantasy world and others found in the Dungeons & Dragons RPG. It won the Origins Award for Best Fantasy or Science-Fiction Board Game in 1995. The game consists of a number of colourful, specially marked polyhedral dice. The gameplay simulates combat between different races of armies for control of the fictional world of Esfah. The original game used races composed of the elements air, earth, water and death. Since then SFR has released "hybrid" dragon characters comprised of all double element combinations. 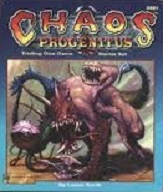 The CDG Chaos Progenitus, initially published in 1996 by Destination Games, was later re-released with the new name Demon Dice by Fast Forward Games, who have since gone out of business. 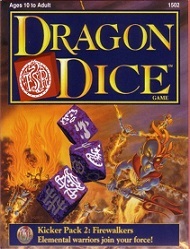 The game was invented by Lester Smith, who also invented the popular Dragon Dice CDG, along with fellow game designer Tim Brown. It is played by 2 to 6 players who each control a "demon" represented by 13 six-sided dice which in turn are marked with symbols/icons that represent either body parts or magical items used by the demon's body parts, which battle the other player's demons. The Demon Dice game was published as an initial starter pack followed by a number of booster packs: "Demon Dice: A Few Parts More" and "Demon Dice: Drippy Are The Damned"..The previous Chaos Progenitus game had an additional booster pack called "Plague Beasts". Neither of the games was as popular as some other CDG games and was eventually discontinued, although it still has a small following to this day.. The Marvel Super Dice CDG was first released by TSR in 1997. The game is played by two players, with a number of six-sided cubical dice marked with icons representing superhero characters from the Marvel comic book universe and their actions/abilities. The starter game package set comes with 18 randomly selected dice ( 9 common, 6 uncommon, and 3 rare), cards, cut-out counters and rules. Further game expansions released feature X-Men characters, including both mutants, non-mutants and their adversaries, and allow greater and more complex gameplay. The games is suitable for adults and children aged 8+, and each game played lasts about 30 minutes. This dice game was invented in 2002 by Earnest James and Toivo Rovainen and released by Cheapass Games. Players roll paper octahedral dice into a combat arena and then use them as miniatures to move around the playing area. The first Diceland was known as Diceland Deep White Sea and was released in 2002 followed in 2003 by four other versions Diceland Ogre, Diceland Space (Terrans vs Urluaquai and Garthans vs Marktians) and Diceland Deep Space. In 2005 came Diceland Cyborg and Diceland Dragons. As well as these sets there are three standard and one oversized promotional dice with the 2005 issue featuring characters from the webcomic Penny Arcade. The Star Trek TNG CDG was inspired by the Star Treck TNG First Contact film. 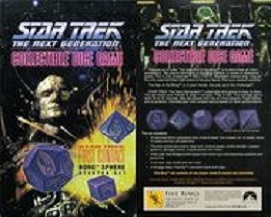 Designed by Dan Verrsen and released by Five Rings Publishing Group in 1996, the gameplay simulates battles between the USS Enterprise and a Borg sphere. A number of different polyhedral dice are used to represent players' spaceship capabilities like weapons, movement, damage control, shields, etc. It was initially released as two Borg and Federation starter packs, with further expansions planned (two representing Klingons and Romulans). For links to Collectable Dice Game related websites try clicking on....... RPG and CDG Links.